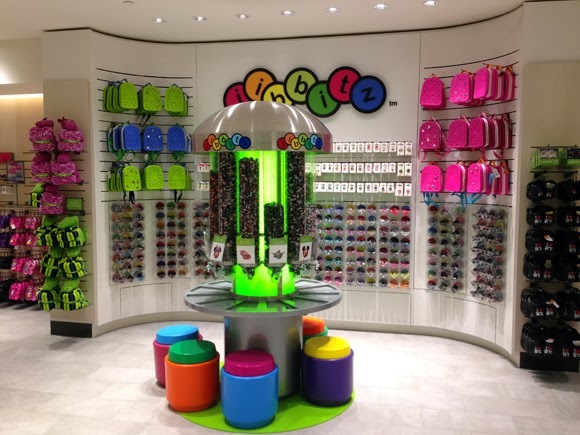 The recently-opened Crocs Herald Square Flagship is adorable. Are you surprised that it's bright, cheery, and fun as heck? 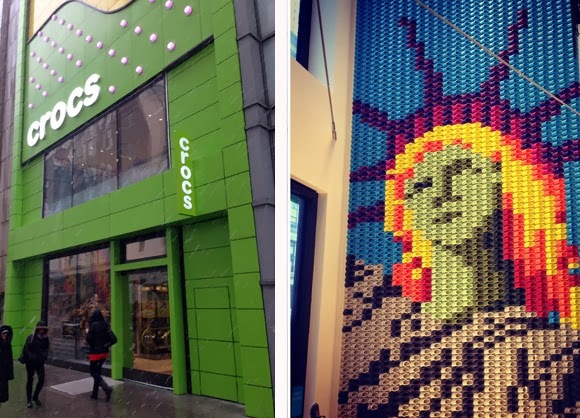 Brightening up a snowy NYC streetscape, left, and the Lady Liberty wall inside, made of kid's Crocs. 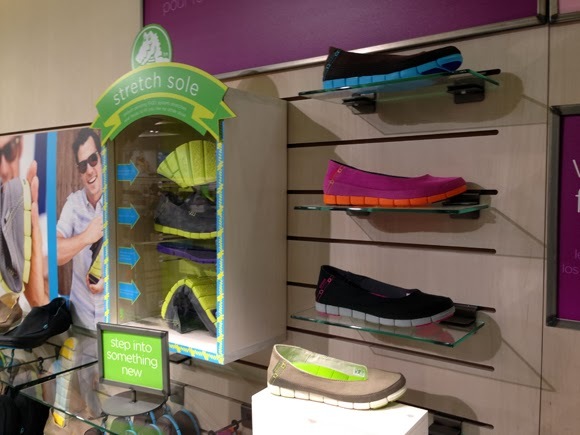 Let's take a tour: on the first floor, in addition to the traditional Crocs clogs, you'll find mostly adult styles like skimmers, sneakers and flats. 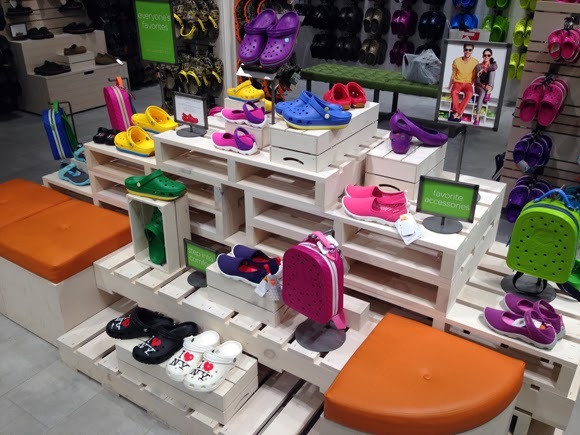 There are also a few kid's styles on the first level, but the real kid's Crocs fun happens on the second floor, with the eye-catching display of jibbitz charms at the top of the stairs. 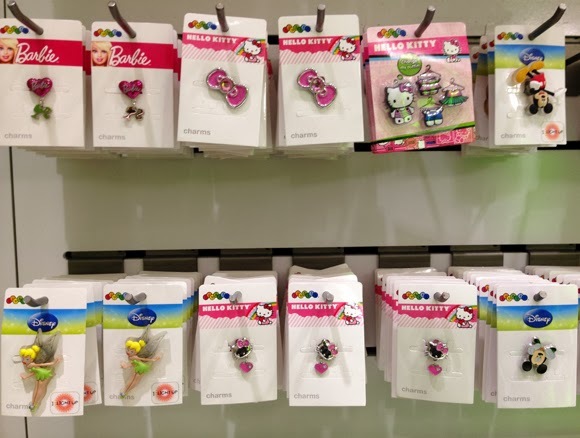 I'll admit it, I didn't realize there was a whole industry behind Crocs charms. As a mom of a 4-year-old, I'd like to say OMG. 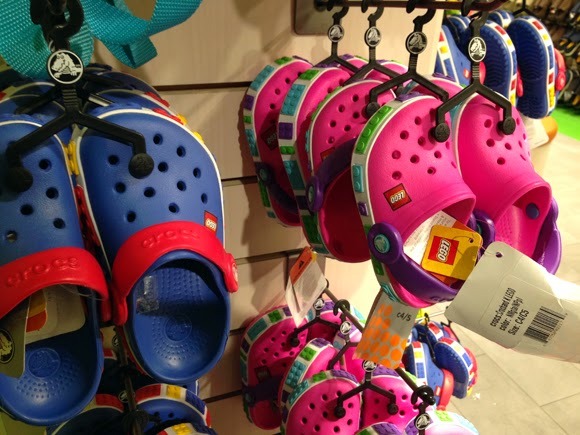 The Lego Crocs are a total win. Also, it's impossible to not love kid's character Crocs clogs. It doesn't matter if you can't get that really annoying Dora the Explorer theme song out of your head: the Dora Crocs are irresistible. Even Boots is well represented. WHO LIVES IN A PINEAPPLE UNDER THE SEA? SPONGE BOB SQUARE PANTS. Best kid's theme song ever? Yes, probably. Hands down, my #1 favorite, most perfect thing in the store. 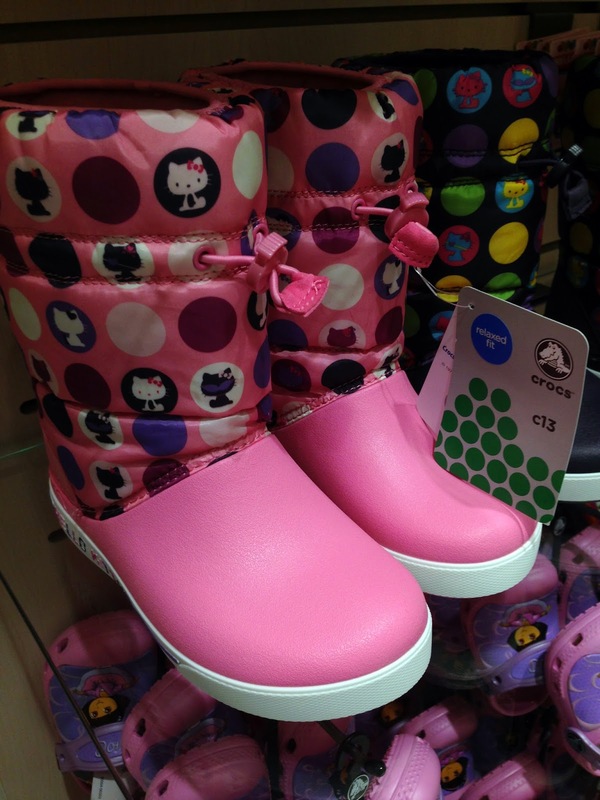 Yes, Hello Kitty winter boots (#thisismylife). Sorry for the indulgent kid's Crocs divergence. 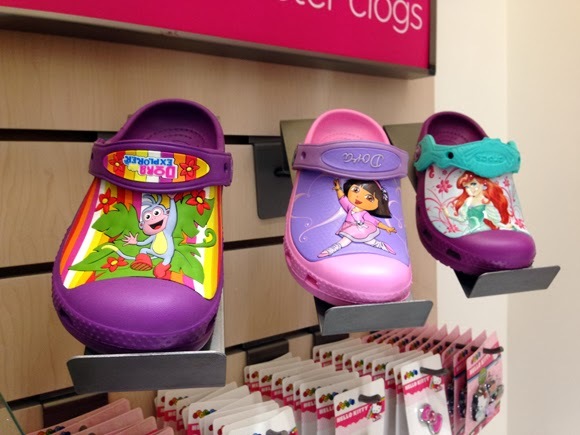 It's just, well, kid's Crocs are so damn cute. 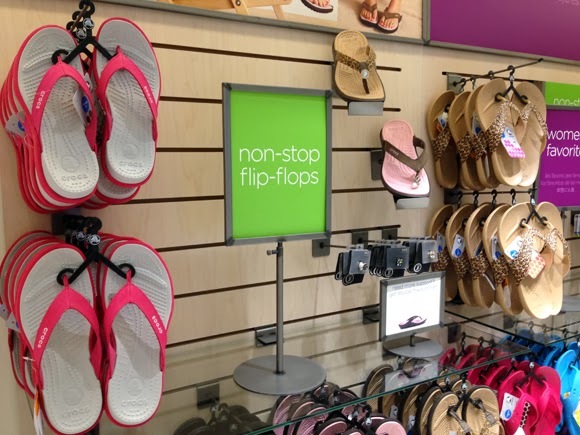 On the less ridiculously bright and adorable side of the second floor, you'll find the Crocs @ work for women and men, and a big selection of flip-flops. 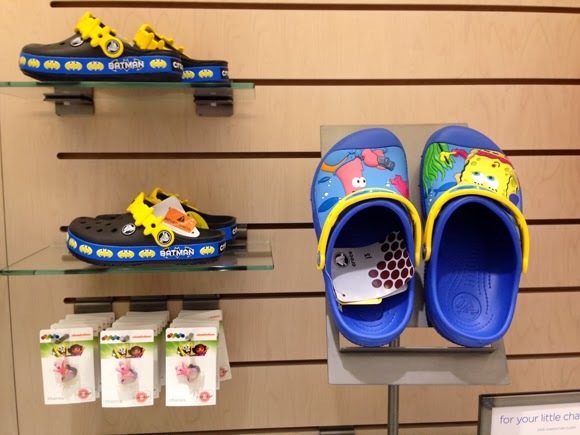 Clearly, Crocs is doing a lot more than just Crocs clogs these days, and the new Herald Square flagship well represents this.